Blank and Jones have been making it big in the past 5 years and especially the past 2 have been truly magnificent for with their weekly radio sets on N-Joy and Einslive, they are one of the biggest acts around. 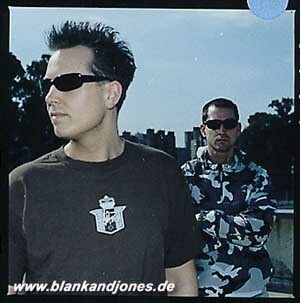 Since their beginnings in house under the guises of Da Bomb and Gorgeous during the late 90s to their massive success in the trance arena under Blank and Jones, Piet and Jaspa have been at the forefront of trance ever since. With awesome releases such as Cream, Beyond Time and more recently Desire, the duo have had their tracks played by everyone from Tiesto, to van Dyk to Judge Jules. Aside from their productions, they have been pushing forward a lot of remixing in the past few years as well, with an awesome remix of Pet Shop Boy's "Home and Dry" which came out in March 2002. These two mid 20s producers have been developing their own music styles throughout the years and if you have yet to hear their weekly sets on German radio stations N-Joy and Einslive, you're missing out big time! Definitely gets my votes for being amongst the best in the world at the moment!